MS PowerPoint PPTX Recovery software from SysInfoTools, open PPTX files and repair the selected data from corrupted Microsoft PowerPoint PPTX files which are corrupt due to various reasons such as virus, system shutdown while saving the file etc. and makes the fresh copy of the at user defined location. 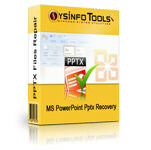 MS PowerPoint PPTX Recovery software from SysInfoTools is exclusively designed for our technical and non-technical users with straightforward user interface and anyone can use the software without requiring any technical knowledge. Supports recovery of unreadable data from corrupt pptx files. Support recovery of batch of corrupted pptx files. Original corrupt file remains intact as a backup. Supports previewing of recovered file before saving them to ensure the integrity of file. Restore the file at user specified location. Repair corrupt and damage pptx files of MS Office 2007. Easy to use, no technical skills required. Preview of the recovered files in the demo version to evaluate the efficiency of the software. Compatible with Windows 7, Vista, 2003, XP, and 2000. If you need more information please contact the developers of Advanced MS Office PPTX Recovery Tool (SYSINFO TOOLS), or check out their product website.